Rainbow chard is aptly named - long, hearty leaves with a rainbow of colors that brighten any meal. Treat these leaves as you would spinach a quick sauté or steam and they're ready to go. 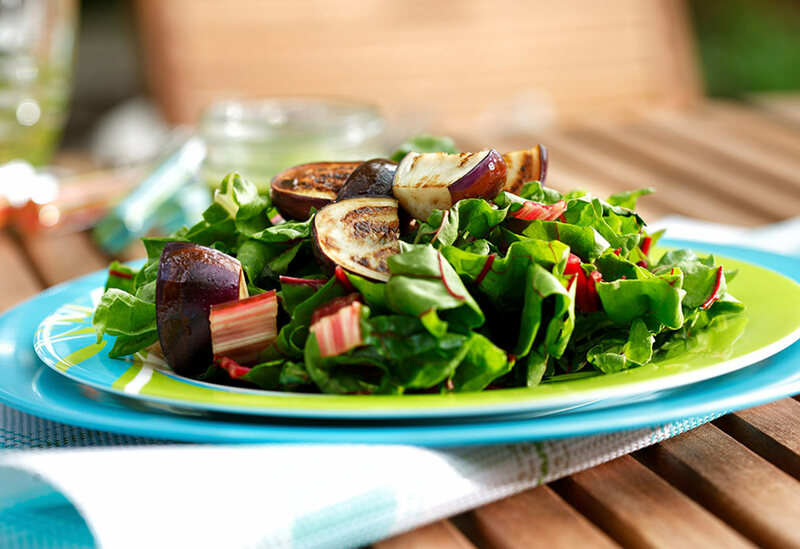 In this salad, the wilted yet vibrant leaves are nestled under baby eggplant caramelized with canola oil. The vegetables are then drizzled with a zesty green vinaigrette made with parsley. 1. In blender, combine all vinaigrette ingredients. Purée until smooth. Set aside. 2. In large skillet, heat remaining 2 tsp (10 mL) canola oil over medium-high heat. Add eggplant and cook 3-5 minutes, until golden brown on all sides, stirring frequently. Remove from pan and cover with foil to keep warm. Set aside. 3. Add rainbow chard to same skillet over medium-high heat. Cook 1-2 minutes or until chard wilts, stirring frequently. Remove from heat and arrange chard on serving platter. 4. Arrange eggplant over top of chard. Drizzle parsley vinaigrette over eggplant and chard and serve. Tips: The meatiness of the eggplant makes this an excellent vegetarian meal, but you may also add grilled tofu or roasted or grilled chicken breast for protein. For variety, substitute beet greens, collard greens or spinach for the rainbow chard. If you've never had browned onions in a salad, this is the time to try it. 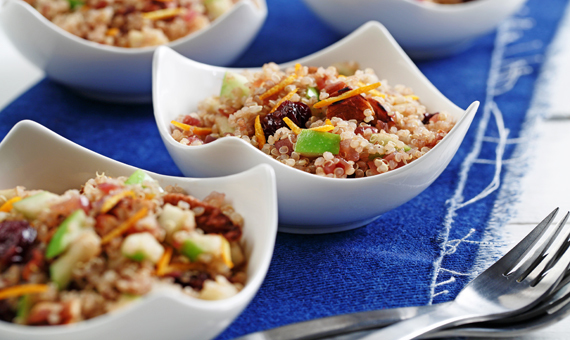 Sautéed in mild-tasting canola oil, the onions are sweet and nutty and bring out the flavor of the pecans. 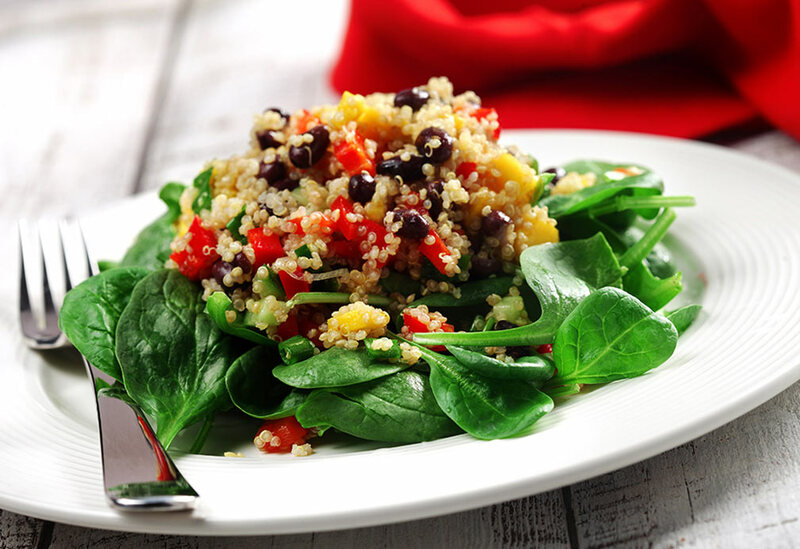 Quinoa, an ancient "grain" that's actually an edible seed related to beets and spinach, makes a fantastic base for a salad. 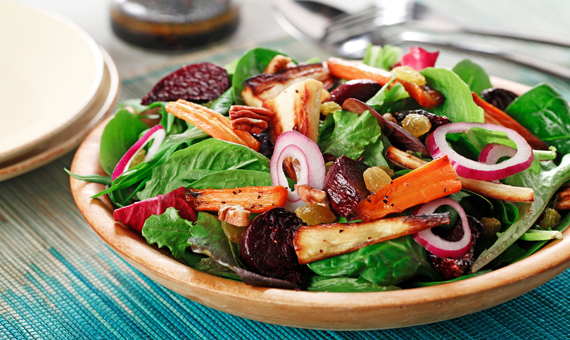 You just can't "beet" the pretty colors in this nutrient-dense salad. The vinaigrette will stay free-flowing even in the refrigerator thanks to canola oil’s low saturated fat content.